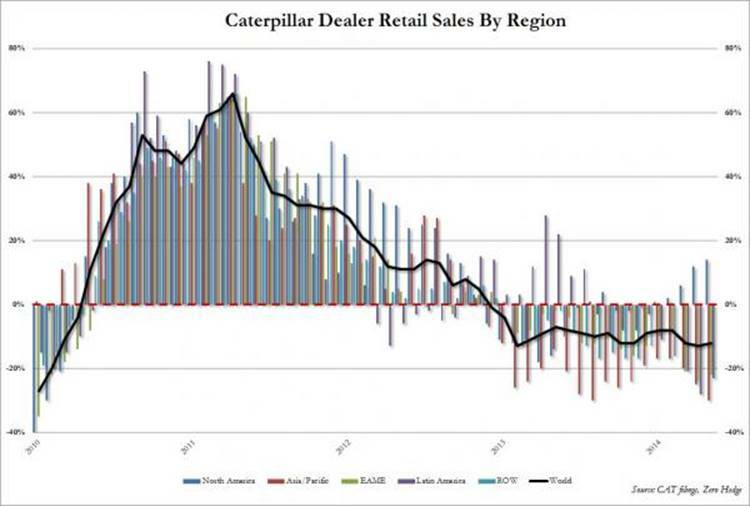 The chart below, showing CAT latest monthly retail sales for the month of May and broken down by region as well as consolidated for the entire world, paints a vastly different picture than that presented by the company’s stock price. The highlights: US retail sales, up 14% in May, were a modest increase from the 12% increase in April. However, the bounce is from a base of a -16% tumble reported a year ago. Still, the US was the only bright spot on a very dreary landscape as the rest of the world continues to slide. In fact, while both the EAME and Latin America region posted their third consecutive month of 20%+ declines (-22% for EAME, -23% for Latin America), it was Asia (read China) where CAT sales have createred, and the -30% plunge in annual retail sales means Chinese demand for industrial equipment is the weakest it has been since the Lehman collapse. Consolidated, CAT retail sales for the entire world declined by 12%, virutally unchanged from last month’s 13% drop, which was the biggest also since Lehman, and represents 18 continuous months of declining annual sales.